When you think of scientists, what comes to mind? Lab coats and microscopes? Beakers and goggles? These images are how science is often portrayed through media, but for many youth—especially in underserved communities—it might be the only impression they have. Which is why Guillermo Giannico and Ivan Arismendi, both professors in AgSci's Department of Fisheries & Wildlife, created the Environmental Leadership for Youth camp, which offers teens an opportunity to better understand science, and more importantly, how it connects to the world around them. Funded by the Meyer Memorial Trust, the goal of the camp is to show kids from underserved communities the possibilities that exist for careers in natural resources and conservation. This includes making them aware of opportunities in NGOs (non-governmental organizations) that are major employers in the Oregon economy, such as the Oregon Watershed Enhancement Board (OWEB), which receives funding from the Oregon Lottery to restore watersheds and natural habitats. Watershed Councils have recognized a lack of diversity in their ranks, and Ana Lu Fonseca in OSU’s Outreach and Engagement has been working with them on issues related to equity and inclusion. The camp was created in partnership with the Outdoor Leadership Institute and Multicultural Summer Camps, which are organized by Mario Magaña Álvarez in Extension’s 4-H Youth Development program. It is designed to expose teens to the outdoors in an engaging way. 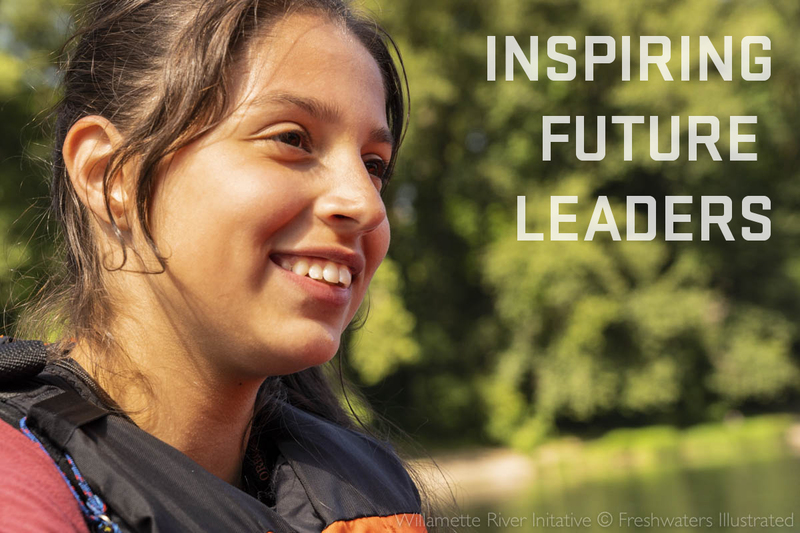 “Many of theses underserved youth don’t think of the outdoors as a resource they have rights to,” said lead organizer Guillermo Giannico, who hopes the teens will become Willamette River ambassadors and eventually counselors who teach in the program. Thirty high-schoolers were given the trip of a lifetime: four days of the full college experience at Oregon State University that included river rafting and mountain hikes.The teens slept in dorm rooms, were given meal cards for campus dining halls, and explored simulated coursework in college classrooms. But more importantly, they got direct contact and one-on-one time with professors, grad students, and undergrads. This allowed them to ask questions and have conversations about college life and career paths in a fun and relaxed atmosphere. The four day camp was organized in a way that demonstrated an overview of watersheds and ecology, following the journey of a water droplet through various ecosystems within the landscape. The program began at the top of Mary's Peak (pictured above), about a half hour west of Corvallis. The Mary's Peak Alliance came out to discuss the history of Mary's Peak, as well as its cultural and ecological importance. Organizers then set the scene for the beginning of a water droplet's journey. Looking west toward the Pacific Ocean, students were able to visualize the water cycle that delivers rainfall to the mountain. Leaders then explained how water would take different routes if it landed on one side of the peak or the other, segueing into a conversation about watersheds. This lesson prepared them for a second day spent largely in the classroom, looking deeper into the way water moves through landscapes and ecosystems are created. In addition to classroom learning about ecology, Joe Scott, a Siletz tribal member, (pictured above left) gave an entertaining and engaging presentation about the Native American perspective of conservation, and the history of settlement in Willamette Valley. Then the teens visited the Bald Hill restoration area, and the Mary’s River Watershed Council came out to provide insight into the area’s ecology. The two other watershed councils who worked with the camp were the Calapooia Watershed Council and the Middle Fork Willamette Watershed Council. Bessie Joyce, program coordinator for the camp, did a fantastic job of scheduling all of the guest speakers and activities. The fun day. This river rafting expedition was run by the Adventure Leadership Institute, which is operated through OSU's Recreational Sports. On the river, the teens observed bugs and water samples that would make great specimens for laboratory analysis. In the future, they will gather and collect these specimens for actual lab analysis in their final day. In addition to observing nature through a scientific lens, they also managed to have a little bit of fun. But no words can tell the story quite like these amazing pictures. Students examined insects and specimens in a college laboratory. They examined the specimens at various stations, all of which were staffed with experts to discuss their findings. Having experts at each station offered the teens a chance to talk one-on-one about science, and also ask questions about careers and college life. The day ended with a tour of the Department of Fisheries and Wildlife collections. Curator Peter Konstantinidis showed them a few samples from the nearly 250,000 specimens kept in Nash Hall. One of the teens is now volunteering in the Collection regularly, and over half of the teens from the camp are working to complete capstone projects with local watershed councils.